First of all I want to say that I am still learning about my graving tools and how to use them. I am fairly new to wood engraving and so far have only carved about ten blocks to make small editions. The problem is finding end grain wood blocks. According to my instructor, Jim Horton of Ann Arbor and former president of the Wood Engravers Network, maple is the best available wood. Those maples grown in the upper Midwest are superior for this purpose. I am not sure where our maple boards came from other than to say a good hardwoods supply store. The ones I have used are scrap pieces glued together to get an end grain block of any size. I am limited to three 1″ boards glued together because the press I use to put great pressure on them is my small book press. The print above was made with a block I had made this way about five years ago and after having another class with Jim, I decided to try it again. Those blocks are even harder to find now if a wood engraver wanted to purchase some. 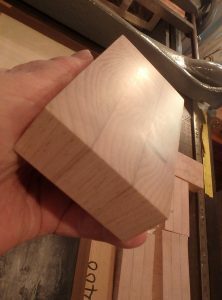 Cut a 24″ long 4″ x 1″ maple board into thirds. 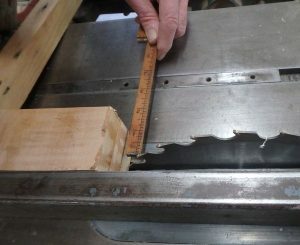 This leaves each board a bit under 8″ with the saw cut. Each of these was sanded using a bench hook with a right angle to help keep them in place. I used my electric Black and Decker Mouse sander starting with an 80 grit paper and then onto a 220 grit. Two of these boards only needed to be sanded on one side. The middle one needs to have both sides very smooth. I then brushed all saw dust away from the surfaces to be glued. Using a cyanoacrylic glue that is super thin and quick drying, Zap Gap by Pacer, I loaded the first board on the smooth side and added the middle board to it. Next came the final board glued down to the middle board, smooth sides together. 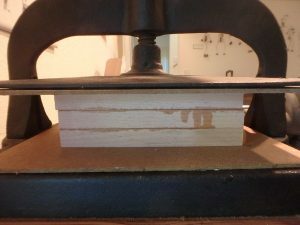 The glued boards were placed between masonite sheets and put into the book press. My book press is small, only 12″ inside for length and will only open to allow this thickness of three boards and two masonite sheets. They are left under as much pressure as possible for 24 hours. 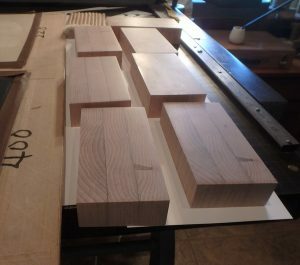 The next day the “loaf” of glued boards are squared up on the table saw and sliced into pieces just a bit over 1″ in thickness. Remember that the end grain will be on the largest surface of the “slice”. 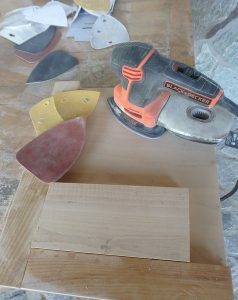 The saw cut blocks are now sanded down on a belt sander with a 220 grit sandpaper. This takes time to get all the saw marks off and work on both sides. 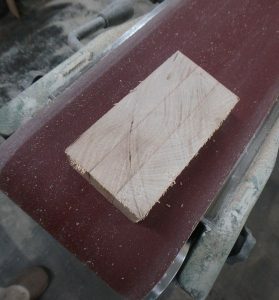 Sand the ends to make square and clean up and rough saw marks. Now it is back to the bench hook and the Black and Decker sander to get the blocks polished down to where there are no seams showing or catching on your finger nail. Try to do both sides as it will become apparent that one side is just better due to better glue contact. Even if there are still seams open, the block is not hopeless. It can be used for an image like say, a stand of bamboo, anything that will disguise the maybe visible lines between boards. Those dark marks that are visible are in the wood itself. 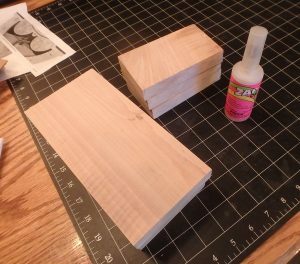 These six blocks came from one length of glued boards about 8″ long. The final sanding is done on sheets of sandpaper that have been fixed onto a flat piece of plywood. The grits are 220, 400, 600 and 1200. Each block is hand rubbed onto successively finer grit paper until they shine and no indication of seam is visible. The blocks are then carefully wrapped in paper and notations of their thickness is written on the side. Also I will note that one may be a “bad block”. That only means that I will have to pick the subject matter carefully to fit flaws in the block. 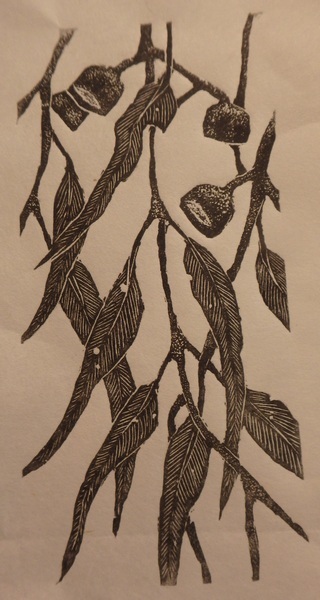 The print above was made from a block that had worm holes in it so I chose the Eucalyptus leaves and pods because the leaves have insect holes more often than not. I do not have access to a proofing press and type so am not too concerned that these blocks are at type high (.918″). But they are close and those under that measurement can be packed on the bottom with papers to get the right level and height. I use these blocks with my etching press and with that I have quite a bit of leeway to get the right contact with the inked block and paper. Hopefully this will help others who love working on the end grain woods with gravers. Nothing quite matches the detail possible with these blocks and the scritching sound when light is carved into the surface. 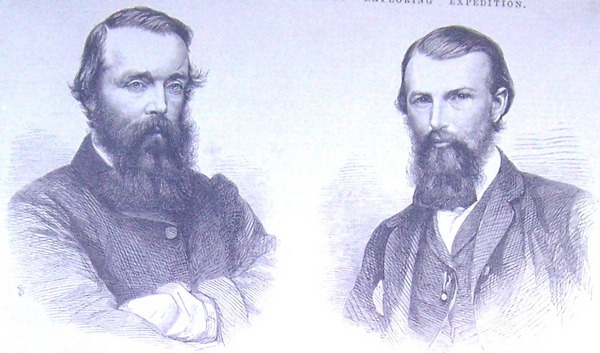 On the subject of Burke and Wills, one of my most memorable trips to Australia was in a small plane put together and piloted by a friend who shares a similar interest in those explorers and offered to take me out to where they perished and other places he thought would be of interest to me. At first I thought it was just a hopeful conversation egged on by shared bourbons, but within a few months he sent me the itinerary for my next time over. 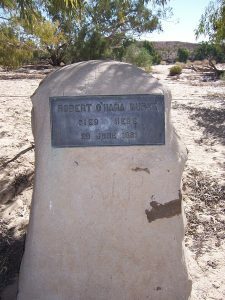 We would fly into where Burke and Wills died. 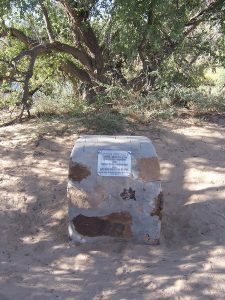 First stop, The Dig Tree, then further inland where a driver would meet us and take us out to the exact sites where they died and we could read their last letters home aloud. At each stop we tied down the plane and walked to where there would be a ride to what we came to see. Innaminka, Birdsville, White Cliffs, and more, finishing up in Broken Hill at a somewhat seedy hotel with one bathroom on each floor for our final night out. When we returned from dinner, they were waiting for the “American” one of us to read a favorite American poem aloud to the gathering of Poets in Pubs Night which just happened to be meeting there that month. A Toohey’s Old among Australian poets in a dingy hotel/pub….excellent! 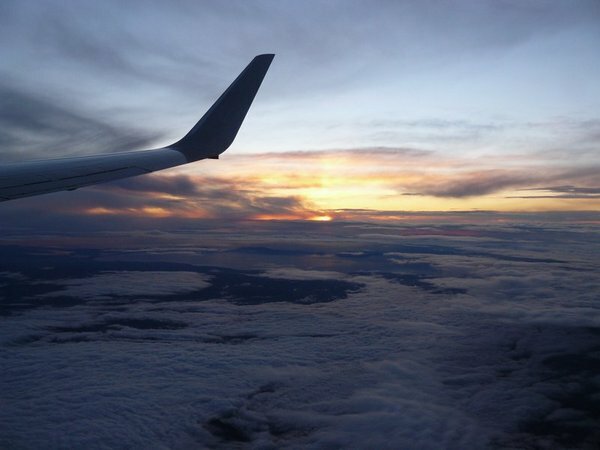 There is a kindness that Australians readily offer to a lone traveler in their country. 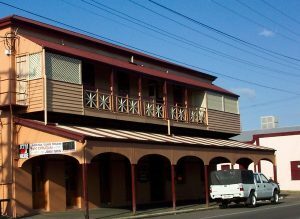 In Townsville on my wedding anniversary a young bartender bought me a nice dark porter on tap at his brewery and showed me to a very private location in which to write, sketch and have the most delicious barramundi. Another similar experience happened in a small pub after teaching and touring wineries. I waited for all on the bus to unload and follow each other to the left. 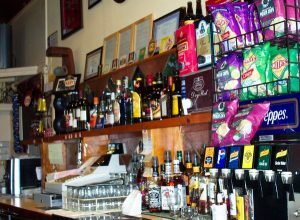 Then I went right, around the corner and into a hotel bar where I met a young man anxious to relive his experiences in the states over a couple of beers he shouted for the only woman in the bar at that hour. Lovely. A coffee shop owner opened early and treated me to a latte after watching me skype my husband from a computer perched on the lid of a garbage can out front in Katoomba. A lovely older woman of means advised me in the lounge car of a train that perhaps I should not drink my dark beer from the bottle but have it put in a glass first. A cab driver who told me all anyone would ever want to know about dingoes. A student in Gympie who told me at the close of the workshop that I had done a good enough job to learn her secret of keeping a spikey hairdo…….leave the soap lather in all day. Kind, informative and patient people in Australia, all anxious to be of help and tell you something you didn’t know. None more so than those who volunteer to look after us during our rushed schedules of teaching, traveling, teaching again and taking a break. They offer beds, refreshments and travel….and all with such obvious enjoyment. Thank you to them and to their country. I have my journals, my notes, my sketches and memories of some of the very best times of my life…..all ready for me when I want to visit again and again. I am looking forward to next March. It will be my twelfth time there. Some places in Australia I will never see but what I have will stay with me forever. But I did go back, asked to return and do it all over again…..ten more times. And each time I drank in the country, in great gulps of experiences documented with drawings and notes. Every penny I could afford went into getting to another place and immersing myself into the land. 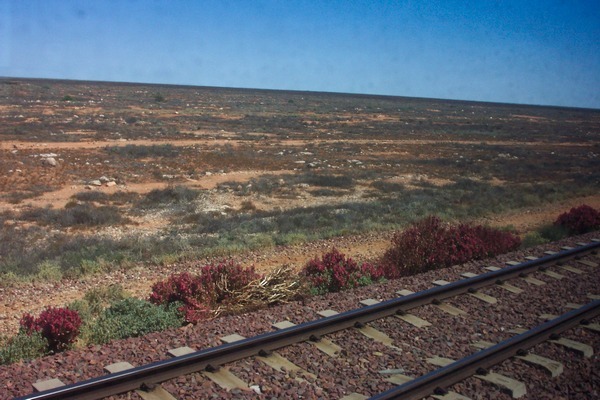 A first class train ride on the Indian Pacific from Sydney to Perth had the country presenting itself by way of a continual travel film passing by the window. 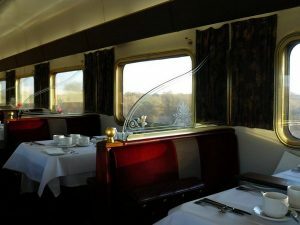 While in the dining car seated at any table with room for a single foreign traveler, I was encouraged to ask as many questions as they could answer while my cabin was magically turned from sitting room to sleeping room. 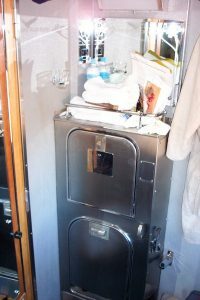 A toilet and sink ingeniously folded down from the wall and in the morning I would be awoken with a gentle knock, a hot cup of tea and a time to be seated for breakfast. And the day would start all over again. Three sisters bringing me flowers to sketch and telling me the names so they were properly documented. It was wonderful and ended far on the other side of the country….Perth with its Botanical Gardens and National Gallery, Freemantle with the remains of the discovered East India Ship, Batavia that I had coincidentally just finished reading about. There was always another generous volunteer driver to take me about and answer questions. 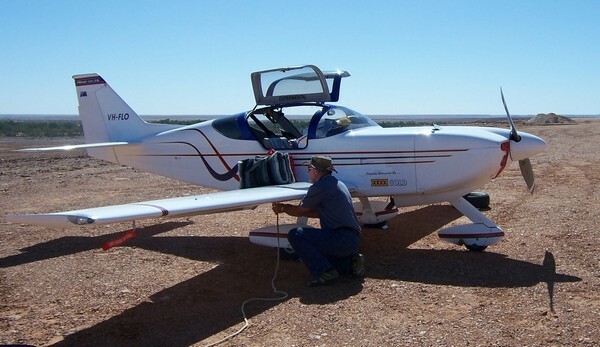 Flying to Katherine from Alice Springs for the first time with a stop for fuel in Tennant Creek was exciting. A bag of chips placed on our seat and a cooler full of sodas to help ourselves. The pilot told me if I didn’t like my chips I could toss them on someone else’s seat and take theirs if I wanted, no worries, he kept an assortment on board. My hosts there in Katherine fixed me up with a snack bag of Anzac cookies for my day trip the Northern Territory Craft Council was treating me to, a cruise on the Katherine River through the Gorge. The second and smaller bus going in to the river was driven by a woman who wanted to show us a camel behind a fence by the road. We were not allowed to get out of the bus and go near it because, with an accusing glance in my direction, she said an American woman told her she was on speaking terms with camels and could be trusted to go up to it and pet it. 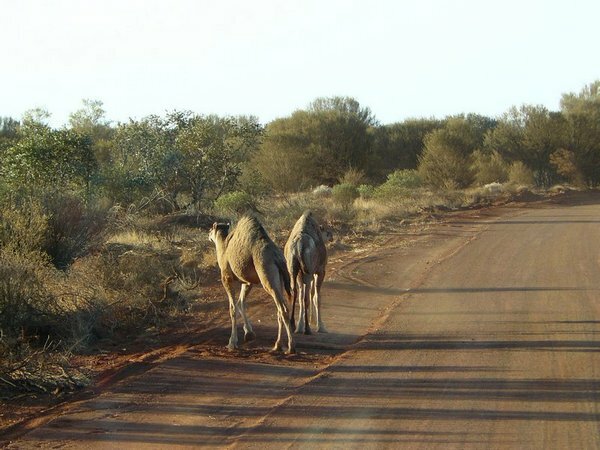 She was bitten immediately and from then on, no one was allowed off the bus at her “camel stop”. 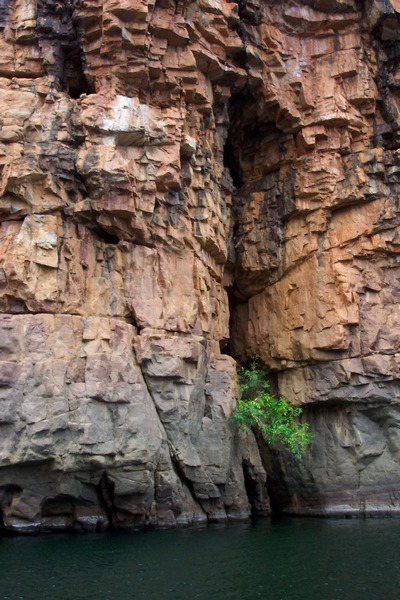 The second time I came to Katherine it was by way of a very small plane with a pilot who informed me in Darwin that I was heading the wrong way on a weekend…..he said most people leave Katherine and come north to the city….not the other way round. He made sure someone was there to meet me before flying back. This time I was housed further out than I had ever been from a town. It was at the time when cane toads were first migrating into the Northern Territory and, so I was told by my Land Patrol host, were deliberately bred to be bigger. They hopped into my wall-less bedroom at dark and reached up the side of my mattress on the floor. I pulled all my belongings into the middle of the bed, took out my notebook and wrote without seeing my pad about how that felt, to be by myself in a dark room with cane toads, big cane toads who could only lope about and reach up with their clinging little toes. Another evening a massive yellowish green snake was matching my pace to the shower a few open rooms down. My hosts knew the snake, all eight feet of him and told me this was its path to the neighbor’s chicken house. I heard such good stories at their place and developed a taste for Vegemite for breakfast served on cold, dried, burnt toast. I thought it doesn’t get any better than this….. in the Outback near a river at the end of a dirt track full of signs warning of the danger of Crocs and no one but us anywhere in sight. 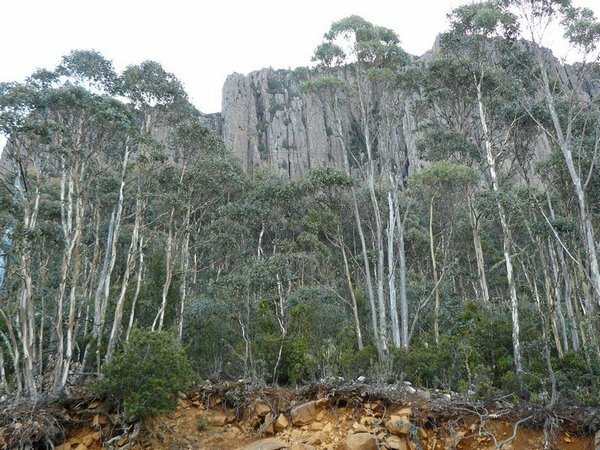 Almost every trip down under included a stay in Tasmania, my most favorite state. So much of it reminds me of home with the gentle hills of green and bluish mountains in the distance. And the basket makers are simply the most generous of time, knowledge and materials…..materials harvested just for the sole purpose of sharing and showing someone new how to use them. They have taken my classes, housed me, driven me to any place they think I would enjoy and introduced me to the magic of Mt. Wellington and the Salamanca Market. They have helped me collect soils for pigments, mended my clothes, shown me how to strip New Zealand flax to weave a basket, given me time to sketch in my journal and given me memorable lines like, “Just out here past the moon is where I will take you in the morning to catch your flight home.” Whenever I see the moon I remember that it will also show up just before you get to the airport in Hobart. 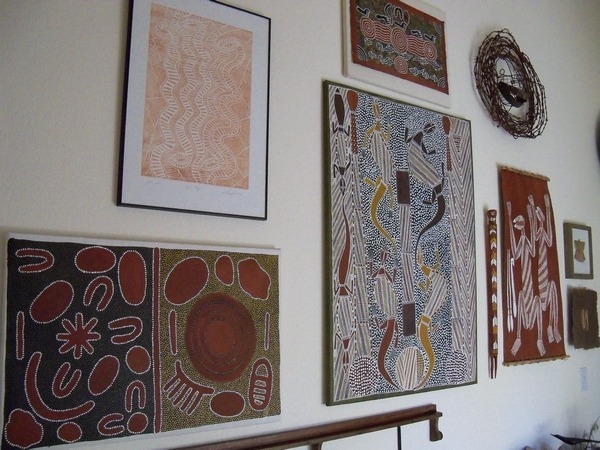 I never miss a chance to stand in front of a painting by Rover Thomas or a room full of Aboriginal bark paintings. All the State and National Galleries have them, hung on large walls in big rooms furnished with benches placed just so. To be able to see a Sydney Nolan retrospective and rooms full of the work by John Davis a personal favorite, printmaker Bea Maddock, are among the many extraordinary opportunities I have had to view Australia’s art. And who can resist the sad narrative paintings by McCubbin and Longstaff’s massive interpretation of the final days of Burke and Wills. It is the statue of those two that make Melbourne my favorite city in all of Australia. Sydney is the opening arms of that country, but Melbourne is the destination. Exceptional vineyards within a few hours’ drive, Federation Square, the bronze statue of Burke and Wills that I love to touch, the State Library, the War Memorial and Botanical Gardens and an endless free ride on the tram through a city filled with the best coffees and savory muffins. It really does not get better than that. I have pretty much made all my plans for the twelfth trip to Australia. Some teaching, some quiet time and a few days of special time working with some of the students who have shown up so often in my classes that we just want to continue working together. I can get it all done in just a bit over a month and be back home. 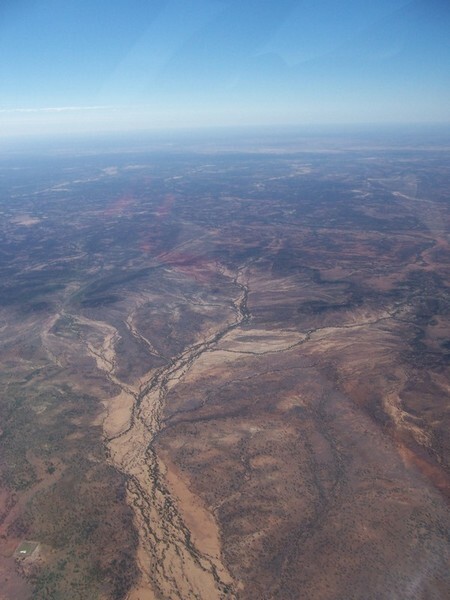 A few years ago I started writing down the impressions and experiences of Australia. So for the next few posts, it will be like a serial of sorts. An installment of the memorable events that have happened down under. It is impossible to express, this feeling of being deeply branded by Australia. How does one put into words the depth of the marks that the country and its people have left on me. I think it started when I was a child with early National Geographic images of something so foreign looking and yet familiar. 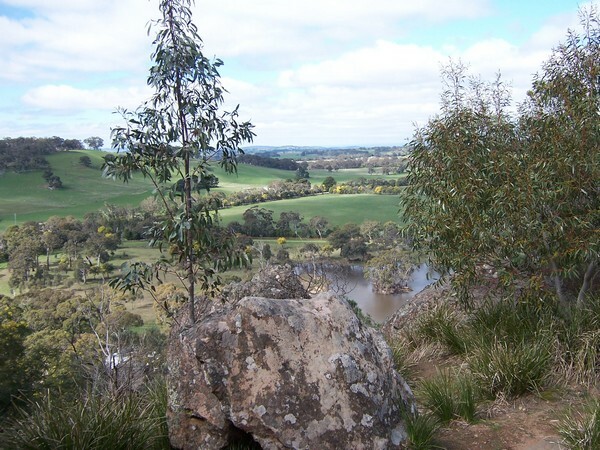 Raised in a rural environment I was drawn to those dramatic country scenes. 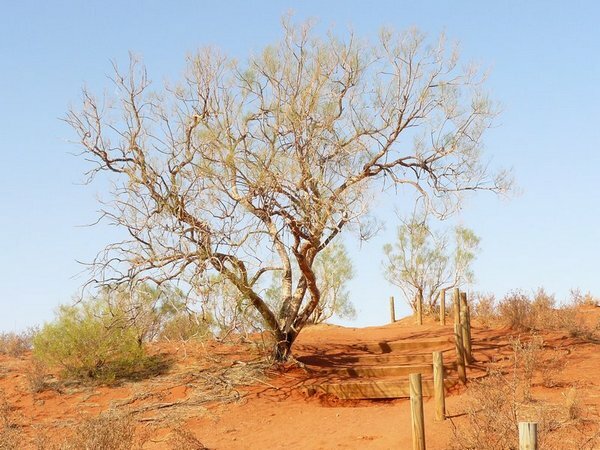 The men and women of the Outback struggling with keeping themselves and their livestock alive in what looked like insurmountable dangers of fire, flood, and distance. Brave, strong people I thought as a child. Friendly, open and honest and busy with lives full of action. Men forever wrestling sheep and cattle and one another. Women surviving on what little they had while they waited and waited for the next demand to take its toll. What I couldn’t imagine from the pictures I saw, the writers of Australia filled in nicely. From convict colonies to contemporary urban scenarios, Australia’s writers, photographers and artists brought their country to life. In 1997 I got the chance to go there and see for myself how real it all was. 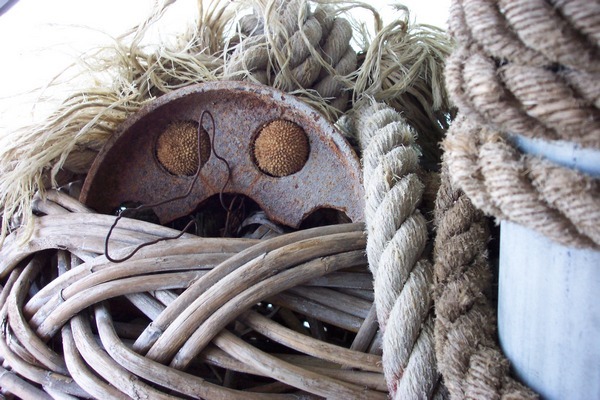 I would teach workshops for the Fibre Forum and be housed and shown the sights. It was magic. The air was clearer, the horizon further away, the sky bigger and bluer, the smells new and different, the sounds exotic and louder, the voices happy-sounding and full of strange expressions. I took it all in and took notes…. constant notes. I photographed everything…..the picture being the physical evidence of my presence in this country. I did not know then that the notes and quick scribbles and drawings would be of more importance to me than the photos…..photos that gave too much information and missed the essence of me being there, at that moment in time. 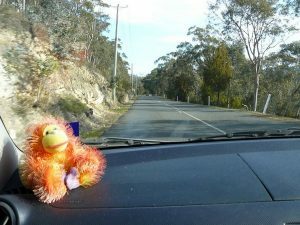 On that first visit I vividly recall my hosts taking me from Canberra to Mittigong and making sure to be in Golburn for a pre-arranged luncheon where the owner would first serenade me with the didgeridoo and then a Civil War melody on his violin because it was the closest he could get to music of where I traveled from. The thoughtfulness that went into giving me that experience as a welcome to their country was the most wonderful and memorable welcome to a country I would never get enough of. 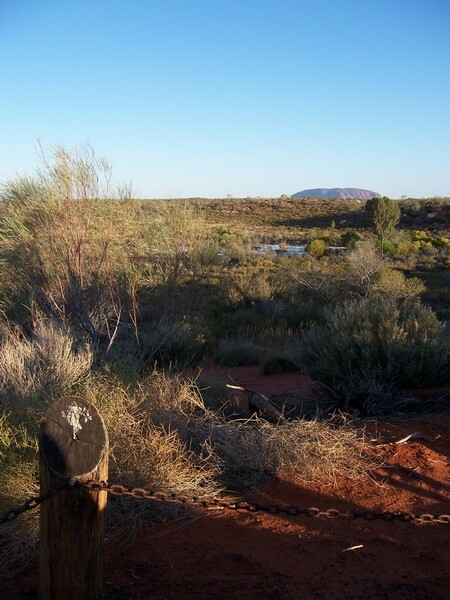 On that first visit to Australia I went to Alice Springs and Uluru…the very soul of Australia. A private pilot flew me out there and banked around Uluru and the Olgas so I could get good photos from the air at dawn. A guide who had last minute cancellations ended up with just me to drive around and accompany on hikes through the Olgas. At the base of Uluru he dropped me off near routes that had few if any tourists and waited to take me to the next back way in. He suggested what I should order for lunch while he went off to catch a thorny lizard for me to see close up before letting it go in the desert. 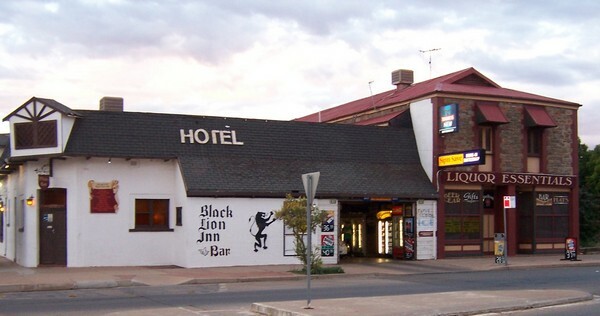 He brought me dark beer to drink while I sat with him and watched the sunset on Uluru, then drove me back to the airport where the pilot waited to take me back to Alice Springs. 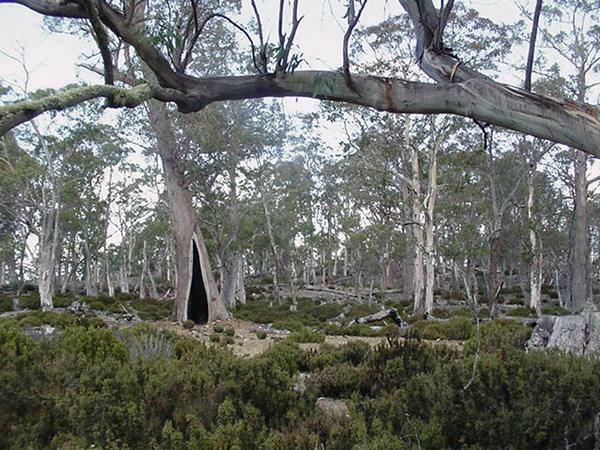 The following day I went to a Coroboree and let the Aboriginal spokesman, George, cut my hair to add to his string while thanking me and saying that the Japanese tourists did not offer theirs. He said he and I had hair with more tooth to grab on. I breathed him deep into my lungs so as to have him and his country stay inside me for as long as possible. Later that morning I ate a witchetty grub and other bush tucker. 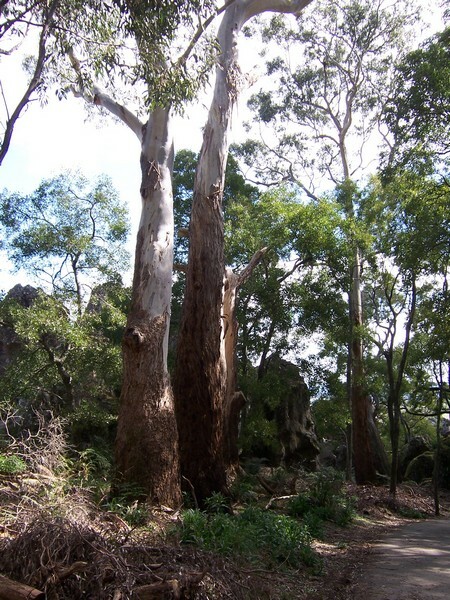 It was at this Coroboree that I bought my first Australian Aboriginal Art. I never thought I was going to come back. I was intent on filling myself and my suitcases with Australia.